Self Help Tutorials That Remind You That Reality is Illusion! Inspired Self Help Tutorials Expose The Paradox Of Reality! Rather than viewing these inspired self help tutorials as teachings disseminating information and knowledge to you, see them as your higher mind or higher self communicating with you and reminding you to remember your awareness of that which you, inherently, already know and understand at the deeper levels of your being. So in that sense, this inspired shortcuts page serves to remind you and thus enable you to understand (which means to remember) such subjects as: the purpose of science, the nature of matter, the power of paradox, reality creation, shifting and changing reality, suffering and your purpose here and now. Using Wikipedia’s definition, the word science comes from the Latin scientia, meaning knowledge, so science is knowledge attained through study or practice, or knowledge covering general truths of the operation of general laws. Check out Wikipedia's history of physics for more information. And consider what’s being said by another author on this spiritual science website as well. From the list above we can see that the primary purpose of physical science is to study and understand our physical world of matter, including its natural laws. In addition, the purpose of science is to learn how our world works and to discover and implement ways that we can live better within our physical reality. 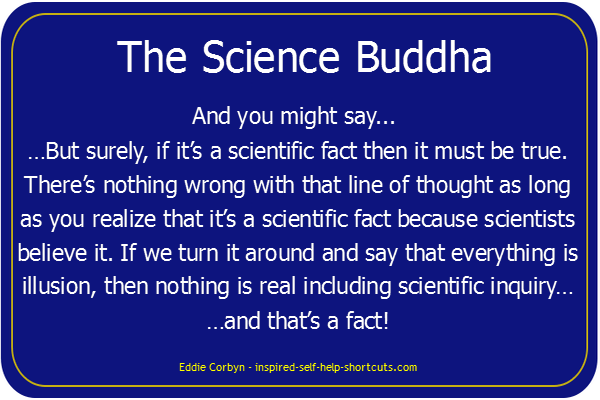 However, while I really do appreciate the efforts of everyone involved in scientific inquiry which obviously makes our life better, I’d like to take this opportunity to identify, through these inspired self help tutorials, the truth and the fact that the subject which science focuses upon, physical matter - isn’t even real to begin with! Quantum scientists have now scientifically proven what many people, throughout history, have always known - that the physical world in which we live is really, primarily, a creation of our mind or an illusion. That is to say, there really isn’t anything 'out there' all reality exists within our mind! Inspired Self Help Tutorials - What Do We Know? Even though we’re having a life experience within the idea of linear time in space, a four dimensional (4D) reality - it’s simply an idea created by our consciousness in order that we can play the game of life on earth! This inspired self help topics page offers insights into the nature of time. Ultimate reality is non-physical and exists independently of both time and space - in the unseen as it were from our current limited perspective. Can the existence of matter be scientifically proven? See what answers you get, but remember what's being said in these inspired self help tutorials and remain focused upon the answer you want – evidence based upon scientific inquiry - actual proof that physical matter has an objective reality. Be careful not to get blinded by long-winded scientific jargon! Physical matter is illusion. 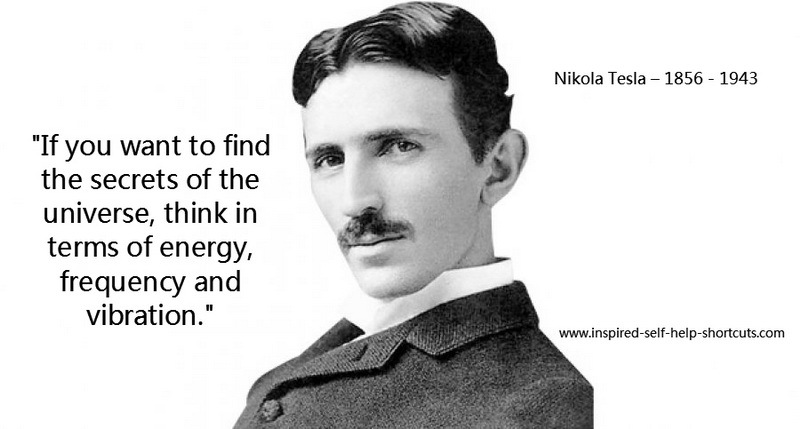 Energy vibrating at different frequencies is real! Through collectively exploring the true nature of physical matter, perhaps you can see that in truth there’s no physical matter as objective reality per se. As technology improves and we’re able to look deeper and deeper into physical matter we continue to discover smaller and smaller particles. Many con-CERN-ed citizens continue to push the envelope of peeking ever deeper into infinity, believing that one day they’ll discover the 'GOD' particle. However, ultimately these citizens will realize that the 'GOD' particle will forever remain elusive, because at the heart or deepest level of physical matter there’s really nothing solid there. Through what's being said on this inspired self help tutorials page I'd love for you to realize that ultimately there is no particle! By understanding that the physical thing we see is really nothing we’re left with phenomena, the phenomena of nature and of all life, which is all of life! Nothing always equals no thing. And as you can see, even when we add 'space' to nothing we’re still left with no thing. Thus, whatever we add to nothing, at the deepest level, we’re still left with no thing. So in truth, really, every-thing is always no-thing or illusion. While I really appreciate the efforts of scientists who throughout history have worked hard to make our lives easier through invention of technology and by providing more understanding - it’s worth remembering that science doesn’t have a monopoly on understanding the nature of reality. After all, science is only one way or one method of exploring the nature of reality. Another way is to listen to your higher self, that inner voice from within, to receive and instantly understand or to know directly the validity of your current line of thought, as explained and elaborated on this inspired psychological self help page. The Buddha and many others throughout history have discovered answers and the truth about the nature of reality by reconnecting with their higher minds. Science spent years using a different approach to finally reach the same understanding - that there's really nothing out there it's all in your mind. You’d be correct in your observation that there certainly is a seemingly solid physical reality all around you. And so your next logical question might be: if physical matter isn't really real then what is it that I see all around me? The answer is - absolutely everything that you see is both a creation of and an illusion of your mind! In truth, there’s no external reality other than that which we imagine, define and believe, through awareness and discernment to be true and which therefore we now choose to experience. And then paradoxically that reality now becomes real for us. This inspired self help goals page goes deeper into the nature of reality. Rationally speaking, even though the existence of physical matter has not been scientifically proven it still makes logical sense that our experience of the world is real, but the world itself is not really real in a physical sense. Look friends this is real. This is actual physics or metaphysics if you prefer that label. It’s not some wild fantasy or philosophy from one individual's mind. Many have seen this throughout history, it's certainly nothing new. It's actually just how it is, how it works and how it's always been. It makes no difference whether you see this as mind creation, phenomena, illusion or as a waking dream in which you’re both the dreamer and the dream. Once you see it all of the observations offered by these inspired self help tutorials will suffix. After all they’re only words and not the real! Inspired Self help Tutorials - What is Reality Then? Through the information in these inspired self help tutorials I’d really like you to 'get' this. Because once you do, you’ll begin creating your life experience in a more deliberate and conscious way instead of by default, instead of by basing your creations on other people’s ideas, their agenda’s, their manipulation and their control. In my opinion, the most helpful thing to remember about reality is that there is no reality beyond your ability to imagine, define and believe in any reality that fits your preference. That is to say, there is no fundamental reality by which you can judge and say: oh yes, but this reality I’m now experiencing is not as real as that other reality. Inspired Self Help Tutorials - How About the Others? Although you're 100% correct in your observation that your life is full of seemingly real people, the apparent others. The thing to realize is that although each expression within your personal reality is an expression of another eternal spirit being, as you are, what you’re actually observing is your own version of them. The version you see in your life experience is based upon your vibrational state of being, so when you change your state you'll see another version. Remember that everything is contained within your own consciousness, including all of the versions of those apparent other people. Thus, to change the version of the person in your world you must change your thinking to reflect what you prefer. And then: either the person will change or they'll disappear from your reality. That is to say, you can't change any external reflection you're getting in the Universal mirror of your life, until and unless you change your mind! Through what’s being said in these inspired self help tutorials you’re now aware that you’re the absolute controller of what you say you prefer to experience. And because, in truth, there’s no such thing as fundamental reality or linear time it means that all possible realities already exist as potential within the idea of Here and Now. Remember, absent 'time' past, present and future all exist simultaneously here and now as parallel realities. And while it’s impossible to change any reality because there’s no 'time' in which change of any kind can take place. It is possible to shift our experience from one simultaneously existing parallel reality to another one. In fact, our consciousness shifting from one parallel reality to another is actually what our experience of change is - only now we’re becoming aware of it. In order to consciously shift to another reality, imagine, define and believe in your newly preferred reality. Your imagination is a signal from your higher self that’s hinting at a direction that it knows will serve you best, after all it is you. Use your imagination to define it and then believe in and feel that newly preferred reality in order to experience it. By really 'getting' what’s being said you’ll begin to realize that you no longer need to suffer within the idea of any reality that you’ve created, unless you prefer to. Pain and suffering are only possible as long as you’re filtering your energy through negative belief systems, thus prompting misalignment with your true self. However, through these inspired self help tutorials, you now know that reality is both a creation of and an expression of your own consciousness. And because you steer your way through any and all realities by your imagination, definitions and beliefs, you’re free to change your thoughts to fit any reality of your preference in order to experience it. Consciously use your mind to focus upon and imagine with feeling the future that you now choose to experience, while ignoring all that you no longer want and which no longer serves you - even though it’s right before your eyes. Then, over time, that continued action will naturally bring your desired change about. The purpose of your life is to remember and BE who you really are, as indicated on this inspired self help article page. And considering what’s been outlined so far by these self help tutorials, your purpose is to reconnect with and listen to your higher self that voice and guidance from within. The truth is it’s not possible for teachers or anyone else to teach you anything about reality, they can only remind you of that which you, inherently, already know! Please submit questions concerning: the nature of matter, illusion, existence, parallel realities and the paradox of reality on this self help tutorials page. Thank you.